We’ve gotten this question a few times over the past few days, so I thought it would be helpful to all of our fans out there to answer this question in a more official manner. Every version of the Model S is designed to work with your PC’s operating system; this means that no matter which physical keyboard you have or which letters may be lasered onto the keys, you can use your operating system to install multiple keyboard layouts that will work. 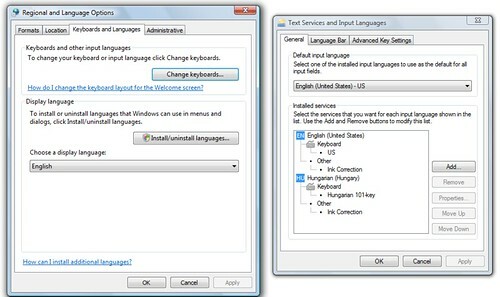 For Windows Vista, for example, you can get to “Regional and Language Options” through the Control Panel, choose the “Keyboards and Languages” tab, then click “Change Keyboards.” This will give you a window that allows you to add new keyboard layouts. In this example I added the Hungarian keyboard to my PC; now I can “alt+shift” toggle between the 2 layouts. The letters on my keyboard obviously don’t change, but now it’s easy for me to type the Hungarian-specific letters like ő, ö, ó, ű, ü, ú and others without using the special character insert feature in Word. So, to our European fans, which layout do you plan on ordering? Do you switch back and forth between different language layouts often? When can we see a Model S Ultimate version for Mac? As for a separate model build especially for the Mac, it’s definitely on our roadmap, but it’s still far enough out that I unfortunately can’t give a specific timeframe. But we know our customers want a Mac version and are working towards it! Thank you sooooo much. I’ve had a US version of the S Ultimate for about a week and love it to bits – if this is what the old IBM keyboard felt like I can see why everyone goes on about it so much. Apple does not give good service to Hungarians, since don’t have a proper keyboard setting for Hungarian language. Battling with with phone calls and emails for more than a year. Especially when the special characters already there just have to switch the letter Y and Z with each other. That is all !!! Yet you refuse to do that. For a programmer 2 minutes job. For other nationalities have it like Croats, Slovaks and so on. I just do not get it ???!!! I call upon all Hungarians who I know here and people of Hungary to boycott Mac products. I’d love to have the Norwegian layout. I don’t ever switch to any other layouts (though I xmodmap some special characters onto the layout). Any update on progress of a proper mac version? Sorry, we don’t share information about what’s in development due the competitive nature of our industry. When we have something to announce, we’ll post it here. What about a French version? Previous Post: Did you notice the new Model S Silent? Next Post: Model S Starts Shipping Today!